Arya Permana is a 10-year-old child who is being called world’s most obese kid. Reportedly, the boy has been put on a crash diet because his obesity has started to affect his life. 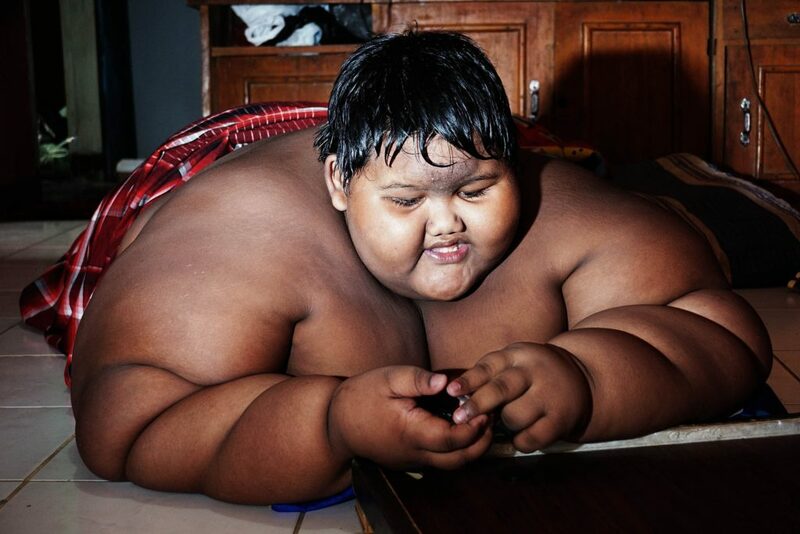 Hailing from Indonesia’s West Java province, Arya Permana weighs 192 kg, and is the world’s fattest boy. The young boy had to quit going to school because he gets out of breath after walking a few steps. Arya wears only a sarong because his parents no longer can find clothes that fit him. Arya Permana is perpetually hungry and goes through five oversized meals a day. Consisting of rice, fish, beef, vegetable soup and Tempeh – a traditional soy patty. His mother Rokayah Somantri says one of his meals is more than enough to feed to full-grown adults. “He only eats and sleeps and when he’s done with both, he jumps into the bathtub and stays there for hours,” the woman said. According to this mother, Arya was born as a perfect healthy child but later there were many changes in him. It seems like the child is suffering through massive problem with his digestion. Arya’s father is a farmer and cannot afford his treatment in the hospital and has to borrow money to feed his only child. However, his parents will now feed Arya with brown rice. This will help to stabilise his health and boost digestion in the body.